Volunteers are one of our most valuable assets. Without them we would not be able to offer the large variety of recreation programs we do, at a reasonable cost to both residents and visitors. The OC Recreation Boosters is a non-profit, community organization made up of area residents and representatives from local community organizations that support youth recreation programs offered by the Ocean City Recreation and Parks Department. Ocean City Recreation Boosters organize events and engage in fundraising activities that help to lower the fees for recreation programs. Since 2001, the OC Rec Boosters have donated more than $500,000 to support the programs of the Ocean City Recreation Department. In addition to fundraising, the volunteers also offer their time and talents at a variety of events hosted by Ocean City Recreation and Parks, including Halloween Spook-Out, Easter Bunny Fun Shop and athletic tournaments. Ocean City Recreation Boosters are critical to the continued success of Ocean City Recreation programs. If you are interested in joining the OC Recreation Boosters or if your business would be interested in helping with fundraising efforts, please call 410-250-0125, email [email protected], or find us on Facebook at OC Rec Boosters. 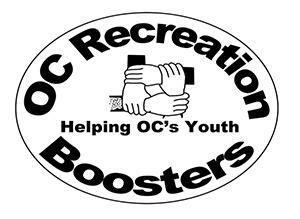 Like us on Facebook to keep up with the OC Rec Boosters upcoming events!